Workplaces need information literate employees in order to manage the increasing quantity and complexity of information that impacts their organizations, yet they provide uneven information literacy education. 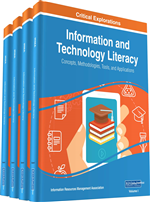 Information and technology literacy are also imperative for the organization as a whole. Decision makers should systematically identify key information and technology literacy processes within the organization, and assess the learning gaps of their employees. Employers should allocate human and material resources to facilitate a variety of formal and informal learning venues, incorporating technology. Such education should also reflect andragogical principles and authentic collaborative learning activities, which can be facilitated by technology-based collaborative tools. To address technology aspects of information literacy in the workplace, each of these key terms needs to be discussed. To start with, information literacy needs to be couched in the context of the Information Society. Globalization of commerce, which requires communicating across cultures and languages. Less vertical integration, which requires more peer-to-peer business planning and communication. “Flatter” organizational structure, which requires more peer and cross-function communication. Less work stability, which requires employees to adapt and be retrained efficiently. More sophisticated equipment and processes, which require employees to have more knowledge and analytical ability. Lower cost digital technology, which may reduce the need for lower- and mid-management, but increase the need for highly literate (including technologically) employees. In this environment, information literacy needs to be incorporated into workplace learning. As noted above, information increasingly depends on technology for its creation and dissemination. International work teams use technology to share ideas and create information products in a cost-effective manner. Outsourcing requires timely information and seamless service that is possible only through technology. Governments depend on technology to provide services and manage functions. The majority of jobs now involve technology and information, which can be overwhelming especially for digital immigrants. How can workers can the skills and knowledge to deal with these new workplace realities?